Come on in! It’s #indieDevHour! was posted on June 25th, 2014 at 11.57am and is filed under Uncategorized. This entry has no comments (yet). You can follow any responses through the RSS 2.0 Feed. Hey all, how about something a little different this time around? Being indie game developers is all well and good, but it would be a rather dull affair without the whole indie dev community! Since we started making games, we had the pleasure to meet and interact with a whole bunch of other developers, see a host of great game still being made, and generally have a pretty good time! Lately, one of our members, Grungi, has been particularly excited about an event held weekly in said developer community. The name of that event is #indieDevHour, and, if you had not figured it out already, is held on Twitter. 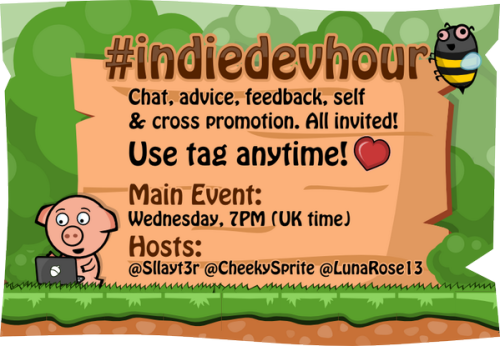 Each Wednesday, at 7PM UK time, developers start sharing on Twitter, appending the hashtag #indieDevHour to their tweets, and get involved in all kinds of conversations. It has proven to be a very effective, relaxed, and easy way to give and receive feedback on your current project, pick the brain of other teams, and generally hang out and have a good time. Think of it as getting together in a bar with like-minded people and showing each others what you have been working on and generally catch up. All from the convenience of your chair or couch! What sets #indieDevHour apart from many other Twitter events like, for example, #ScreenshotSaturday, is the sense of community the hosts (Sllayt3r, LunaRose13 and Cheeky Sprite Studio) have managed to impart to it. They have managed to foster a really inviting atmosphere, and many great conversations, as in real back-and-forth, not just people spamming links, are always just a tweet away. And the fun does not stop at the end of the designated hour! A Skype group chat has been created and is run by Sllayt3r for chatting with other indie devs, and people are sharing news, questions and feedback with the hashtag all throughout the week now! Of course, your first #indieDevHour might feel a little crazy, given the sheer volume of tweets and the branching nature of Twitter conversations, but hang in there! With a good Twitter client like Tweetdeck, there is nothing you cannot overcome! So, see you next Wednesday, 7PM UK time?